This film's screenplay was written by Welles in only nine days. He had first adapted the story for a CBS-radio broadcast (Campbell's Playhouse) with his Mercury Theatre in the fall of 1939, featuring Walter Huston as Eugene Morgan and Welles himself as George Minafer. He used his regulars from Mercury Theatre within this production: Joseph Cotten, Agnes Moorehead and Ray Collins (the only actor in the film who also appeared in the radio version). Although the beautiful, near-masterpiece film is rich in cinematic technique (overlapping dialogue, deep focus cinematography and magnificent lighting, fluid dolly and truck shots, innovative crane shots, iris in-out openings and closing of scenes, long takes, etc.) and layered with complexity and subtle meaning, in its initial preview screening, it was a disastrous flop for its emotionally-downbeat mood, and because of its focal point: a spoiled brat (played by B-Western actor Tim Holt) of the town's richest family and later, as a conceited young man. Ambersons' public previews (in Pomona, California) were considered a disaster due to its being inappropriately double-billed in its premiere showing with a B-comedy starring Lupe Velez titled Mexican Spitfire Sees a Ghost (1942), and because of its original depressing ending. Worried about its financial viability and the unreleasable nature of the film, RKO studios, in Welles' absence while he was in Brazil, proceeded to drastically cut the film, from its originally-edited, first-cut length of 131 minutes down to a mere 88 minutes of both original and reshot footage. More than 50 minutes of original footage were removed - over a third of Welles' original footage, by shortening extended tracking shots, and eliminating or drastically abbreviating other scenes. With a tacked-on, optimistic ending, and with the addition of rewritten/reshot portions of film without the director's approval (under the supervision of editor Robert Wise), it was re-released, and all surviving footage from the original film was destroyed (to prevent any efforts at reconstruction). In spite of controversies surrounding the film, it was still nominated for four Academy Awards: Best Picture, Best Supporting Actress (Agnes Moorehead), Best Black and White Cinematography (Stanley Cortez), and Best Black and White Interior Decoration. The story of the film spans two generations (about twenty-five years), and is set at the turn of the century in an upper-middle-class Midwestern American town [Indianapolis, Indiana - identified by the front page of the Indianapolis Inquirer at the end of the film]. This tale is set against the social decline, ruin and fall of the aristocratic Amberson family at the turn of the century with the coming of the industrial age and the rise of the automobile (and the prosperous Morgan family). Industrial and technological progress parallels the decline of the fortunes of the wealthy Amberson family. The story was later remade in 2001 at 150 minutes by director Alfonso Arau, aired on cable TV's A & E Network, with stars Bruce Greenwood, Madeleine Stowe, Jonathan Rhys-Davies, James Cromwell, and Jennifer Tilly. After fading to another black screen, Orson Welles in an impressive, radio-announcer style voice-over narrates nostalgic segments taken from the first portion of Tarkington's literary work. In the film's prologue (first ten minutes), the outer perimeter of the frames are edged or rimmed with a soft-focus, faded, vignetted effect, suggesting the time period and its fashions and giving the look of old faded photographs in an album. In the film's short beginning, all the major characters are economically introduced. 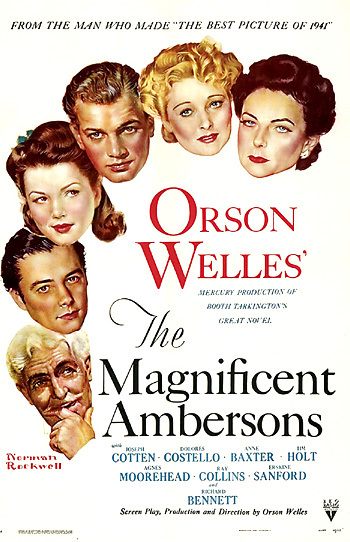 The magnificence of the Ambersons began in 1873. Their splendor lasted throughout all the years that saw their Midland town spread and darken into a city. In that town in those days, all the women who wore silk or velvet knew all the other women who wore silk or velvet and everybody knew everybody else's family horse and carriage. The only public conveyance was the streetcar. A lady could whistle to it from an upstairs window, and the car would halt at once, and wait for her, while she shut the window, ... put on her hat and coat, ... went downstairs, ... found an umbrella, ... told the 'girl' what to have for dinner...and came forth from the house. Too slow for us nowadays, because the faster we're carried, the less time we have to spare. [This short montage on changing male fashions was inserted here by RKO Studios into the original sequence of the prologue - slightly earlier than Welles had intended.] During the earlier years of this period, while bangs and bustles were having their way with women, there were seen men of all ages to whom a hat meant only that rigid, tall silk thing known to impudence as a stovepipe. But the long contagion of the 'Derby' had arrived; one season the crown of this hat would be a bucket, next it would be a spoon. Every house still kept its bootjack. But hightop boots gave way to shoes and Congress gaiters, and these were shaped through fashions that shaped them now with toes like box ends and now with toes like the prows of racing shells. Trousers with a crease were considered plebian; the crease proved that the garment had lain upon a shelf, and hence was ready-made. With evening dress, a gentleman wore a tan overcoat, so short that his black coat-tails hung visible five inches below the overcoat. But after a season or two, he lengthened his overcoat till it touched his heels, and he passed out of his tight trousers into trousers like great bags. Fashions and customs of the day are rapidly being changed, in this fashion montage sequence. In a crowded saloon bar with swinging doors, men in stovepipe hats drink heartily. (Protagonists in the drama to follow - but now presented anonymously - model the older and newer styles.) Wilbur Minafer [unrealistically, this is in fact George Minafer, the only child of Wilbur] in a stovepipe hat and frock-coat sits in a boat and rows his pretty sweetheart Isabel with a parasol over her shoulder out onto a lake. A stovepipe hat is knocked off a man's head - Major Amberson's head - by a snowball, symbolic of their replacement by new, more democratic styles. Eugene Morgan (Joseph Cotten), a young representative of the new industrial bourgeoisie who narcissistically values the latest modern clothing, stands before an oval mirror and tries on two new styles of derby/bowler hats. He also uses a bootjack to try on new styles of shoes. High-top boots are soon superceded by shoes and Congress gaiters. Humorously, a vain-minded Morgan tries on more new fashions in front of a long, ornately-framed mirror - two kinds of shoes, two changes of pants (he balances on one leg as he struggles to put them on), and he models two fashionable evening overcoats (with accompanying baggy trousers). Morgan leaves his front door, bearing a smartly-wrapped gift package under his arm. In those days, they had time for everything: Time for sleigh rides, and balls, and assemblies, and cotillions, and open house on New Years, and all-day picnics in the woods, and even that prettiest of all vanished customs: the serenade. It is now wintertime as the seasons pass by very rapidly - a counterpoint to the notion that "they had time for everything." The house is pictured with snow on its roof. Horse-drawn sleighs pass the front gates from left to right. Boys throw snowballs at each other. As the serenade is mentioned, the season dissolves and is transformed into the season of spring and then summer and then to twilight on a moon-lit summer night. The house is strung with pretty lanterns. Then, the image turns dark, the moon disappears, and the only light that glows is on the left of the frame. On a summer night, young men would bring an orchestra under a pretty girl's window, and flute, harp, fiddle, cello, cornet, bass viol would presently release their melodies to the dulcet stars. Against so homespun a background, the magnificence of the Ambersons was as conspicuous as a brass band at a funeral. There it is, the Amberson mansion. The pride of the town...Sixty thousands dollars worth of woodwork alone. Hot and cold running water, upstairs and down. And stationary washstands in every last bedroom in the place. I guess she's still mad at him...Isabel. Major Amberson's daughter. Eugene Morgan's her best beau. Took a bit too much to drink the other night right out here and stepped clean through the bass fiddle serenadin' her. Within a barber shop (a typical site for male gossip), Uncle Jack (Ray Collins) turns around toward the camera from the barber's chair and describes Wilbur to the audience: "Wilbur? Wilbur Minafer? I never thought he'd get her. Well, what do ya know? Well, Wilbur may not be any Apollo, as it were, but he's a steady young business man." What she minds is his (Eugene) makin' a clown of himself in her own front yard. Made her think he didn't care much about her. She's probably mistaken but it's too late for her to think anything else now. The wedding will be a big Amberson-style thing. Raw oysters floating in scooped-out blocks of ice. The band from out of town. And then Wilbur will take Isabel on the carefulest little wedding trip he can manage. And she'll be a good wife to him. But they'll have the worst-spoiled lot of children this town will ever see...She couldn't love Wilbur, could she? Well, it'll all go to her children, and she'll ruin them. (Welles' voice in narration) The prophetess proved to be mistaken in a single detail merely...Wilbur and Isabel did not have children; they had only one. (Mrs. Foster's voice intones) Only one! But I'd like to know if he isn't spoiled enough for a whole carload. (Welles' continues) Again, she found none to challenge her. George Amberson Minafer, the Major's one grandchild, was a princely terror. There were people, grown people they were, who expressed themselves longingly. They did hope to live to see the day, they said, when that boy would get his come-uppance. Husband: His come-uppance! Something's bound to take him down someday. I only want to be there. In the garden of the Amberson mansion after the fight, George (wearing a kilt and tam-o'-shanter) is reprimanded by his parents and aged patriarch Major Amberson (Richard Bennett) as he stands formally in front of them. [The characters in the scene look like tableaux figures posed before an artistic backdrop of an old painting.] George, positioned in the foreground, dominates the scene and shows total disregard for his accusers or family behind him. Wilbur, squeezed to the right side of the frame, reads only a sentence from a letter written by a concerned citizen about George's foul use of language: "This was heard not only by myself but by my wife and the lady who lives next door." Isabel (to George): You must promise me never to use those bad words again. George: I promise not to... (pause) unless I get mad at somebody. During the holidays, George Minafer (Tim Holt) returns at age twenty as a sophomore from his schooling without any change in his arrogant personality and air of superiority - he passes through town again like a charioteer in a horse and buggy, whipping one of the bystanders: "...nothing about him encouraged any hope that he had received his come-uppance." Cards were out for a ball in his honor, and this pageant of the tenantry was the last of the great long-remembered dances that everybody talked about. Eugene Morgan returns to his hometown after eighteen years' absence as a widower, bringing his now-grown, attractive daughter Lucy Morgan (Anne Baxter in her film debut) back to the town where he was born and to the place where he was previously denied admission. In a long, flowing dolly/tracking shot, Eugene and Lucy enter from the snowy outside into the two front doors of the exquisite, splendid mansion the night of the lavish party - winddraft-swept and with the sound of tinkling crystal chandeliers and Christmas tree ornaments. When Eugene is reunited with Isabel in the hallway, he obviously still retains his love for her, and she with him.